Nominated for two 1997 VFX HQ Awards: Best Matte Paintings and Special Achievement Award, Winner of Best Matte Paintings. Martin Scorsese's sweeping epic following the life of the fourteenth Dalai Lama contains dozens of visual effects, provided by some of the industry's finest effects houses. The majority of the effects are wide, landscape vistas completed as complicated matte paintings. 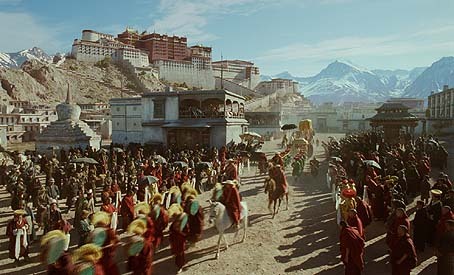 The film, having been mainly shot in Morocco, featured numerous sky/mountain enhancements to simulate the Tibetan geography, as well as a number of stunning shots of Lhasa, the home of the Dalai Lama. Crowd duplications and other delightfully invisible effects exist within KUNDUN, one of Scorsese's most visually stunning films. Just one of the remarkable matte painting shots of KUNDUN. The top image is the a frame of the Morocco-shot background, and the bottom image is the final shot as it appears in the film. The shot was created by Compound Eye, subcontractor to Dream Quest Images. 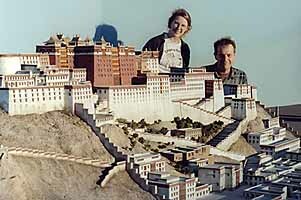 Below is Elise Robertson and Nicholas Blake of Compound Eye posing in front of the model created as reference for the film's matte paintings. 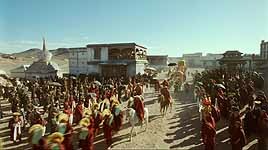 Matte World Digital provided a number of shots to KUNDUN, including this terrific composite; a wonderful shot featuring a young Dalai Lama watching Chinese troops gallop toward Sho. The top image is the bluescreen photography, with the bluescreen removed. The middle image is the completed matte element, featuring blowing dust and other animated elements. The bottom image is the final composite.